The Oil industry is one of the pioneers in the widespread adoption of optimization techniques. 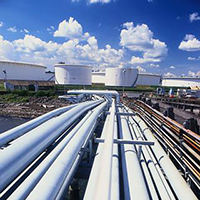 The term “Refinery optimization” has consequently evolved to become a multi-faceted concept. At an abstract level, refinery optimization is about getting the most from the existing assets; by extension, it can also refer to the most profitable investments in new equipment or new assets. This first distinction gives rise to 2 horizons of application to refinery optimization: long term, structural optimization, and short term operations optimization. Moreover, operations management itself can be addressed in a variety of ways, depending on whether the approach taken to refinery optimization is bottom-up, or top-down. In contrast to traditional bottom-up approaches – which attempt to build an overall solution by aggregating local solutions – we start by achieving a feasible, “good quality” overall solution using our smart simulation engine. Then, guided by the consistent overall solution, we seek to optimize local operational challenges. Regardless of the inherent formal difficulty of achieving an overall refinery schedule optimization, an overall optimized schedule is of little use. This is simply because an overall solution achieved that way is inherently unstable: the slightest change or unforeseen event means that the whole schedule must be rebuilt. And given the huge amount of inertia in such a large system, any sudden change of trajectory consumes an equally huge amount of energy. Under this pragmatic perspective, refinery optimization appears as the search for a maintainable globally feasible, locally optimized schedule. Optimization is applied to sub-systems where a high economic impact is achievable. To be realistically achievable, effective and efficient, refinery optimization therefore should be considered as an orchestrated effort that needs to be put in practice under uncertain assumptions, and this approach should therefore provide the means to confidently and rapidly implement day-to-day adjustments to subsystems to achieve locally optimized schedules. PRINCEPS solutions materialize refinery optimization through a right combination of smart simulation and local optimization modules. This would be the best way for you to get a good idea about how our products can help you achieve refinery optimization in production conditions.